Press release is a advertising announcement issued towards news media and other targeted publications for the purpose of letting the open public know of business developments. Think of a press release as your ticket to publicity, one that will get your business coverage in ebooks or on TV and stereo. 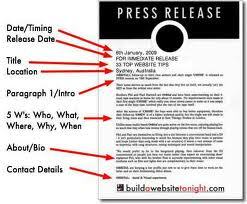 Editors and reporters get numerous press releases per day. This article briefly describe six reasons that may reason of failure: Keyword overload, Sounds like a sleazy car commercial, Saturation, No hook, Jargon is incomprehensible and Boring Headline.